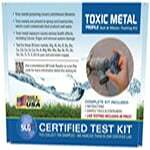 Are you or your family breathing in toxic organic chemicals from cleaning supplies, varnishes, paints and solvents? 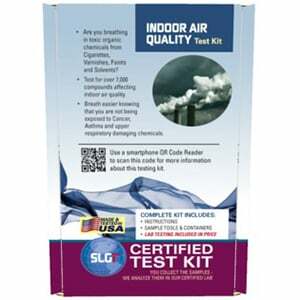 The Schneider Laboratories Global, Inc. Indoor Air Test Kit can check for the presence of thousands of organic compounds that may affect your indoor air quality. This test will compare your air sample to a library of organic compounds such as benzene, , heptane, hexane, xylenes, limonene, caprolactam, and much more. These are organic compounds that can be found in cleaning supplies, plastics, nylon, upholstery, solvents and other materials that can be in your home. Since this library holds thousands of organic compounds, only the compounds that are detected are reported. 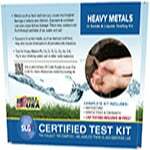 Note: This Test Kit DOES NOT test for mold, asbestos, radon, nicotine or carbon monoxide in the air. This kit is simple and easy to use and comes complete with everything needed to check for the presence of the organic compounds present in the library. Once sampling is completed simply ship the sample back in the original box. Analysis Fee is included in the price. NO hidden fees. Professional and accurate analytical results are available to view online within 5 business days of receipt of your kit. 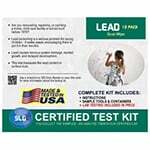 Test Kit comes complete with all sampling material and paperwork needed to take a sample and send it back to us in the prepaid shipping bag. A professional, accurate, and certified analytical report will be available online within 5 business day of receipt of samples in lab.